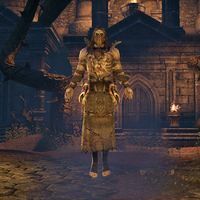 The Bloodthorn Cult was a necromantic cult devoted to Molag Bal and led by a Reachman named Angof the Gravesinger. It was established during the attempted Planemeld in the Reach, at the time an independent kingdom ruled by the Despot of Markarth, although it welcomed initiates from other backgrounds as well. The cult was known for harnessing dark nature magic through the cultivation of Bloodthorn vines, and used them to corrupt the land and raise zombies. Angof's main goal was to conquer and corrupt the region of Glenumbra in High Rock. He headquartered the cult at the ancient cemetery of Cath Bedraud, seemingly establishing his presence there as early as 2E 578. However, the cult's invasion didn't begin until the onset of the Alliance War in 2E 582. The cultists first took control of the many burial sites in the King's Guard region, raising the dead as minions. Angof himself travelled to the ancient battlefield at Glenumbra Moors, resurrecting the long-dead Alessian general Faolchu. Faolchu was a Changeling and a powerful werewolf in life, and was forced to serve Angof by spreading lycanthropy throughout Glenumbra, ultimately overrunning the city of Camlorn and infecting the Breton nobility. News of the cult's activities were slow to spread, and its corrupting influence extended as far south as the region's capital of Daggerfall. The cultists allied themselves with the Red Rook Bandits and began an attempt to corrupt the Wyrd Tree, the source of all life in Glenumbra. To do this, they created lurchers and trapped the Guardians of the Beldama Wyrd, ancient Ehlnofey worshipped by the local witches. An associate of Angof called Vardan looked beyond Glenumbra and secretly established the cult on the small island of Betnikh. He discovered a powerful Ayleid relic on the island in Carzog's Demise, and disturbed the Ayleid, Breton and Orcish spirits of the island in order to obtain it. With the relic, Vardan planned to wipe out the local Seamount Clan and gain control of Betnikh before betraying Angof and claiming Glenumbra for himself. However, the Seamount Orcs learned of the cult's activities and slew the invaders with the help of the Soulless One. Reeling from the cult's threat, the Seamount Clan sent a petition to Daggerfall to join the Daggerfall Covenant. King Casimir initially disregarded the threat of the Bloodthorn Cult, until an attempt was made on his life. The Lion Guard were duly ordered to march north and put an end to the Bloodthorn menace. The Beldama Wyrd succeeded in freeing the Guardians and restoring the Wyrd Tree, and the Lion Guard were similarly successful in protecting Aldcroft from werewolves, retaking Camlorn from Faolchu, and breaking the cult's alliance with the Red Rooks. However, the settlement of Eagle's Brook fell to the cult, and its entire populace were raised as zombies. The briefly-lived plane of Oblivion known as Lord Velian's Plane was created during this event by another cultist-turned-renegade. The Lion Guard would eventually lead a final attack on Cath Bedraud with the help of the Soulless One. Angof was defeated in combat and the threat to Glenumbra was ended, allowing the region's dead to return to their rest. In death, members of the Bloodthorn Cult went to Coldharbour, their souls claimed by Molag Bal. As punishment for their failure, Bal sent them to the Cliffs of Failure to partake in unending battles led by Angof. Angof became repentant in death, seeking to redeem himself and cure his disfigured body. Under the watchful eye of a Dremora known as the Observer, the cultists were forced to face off against the Worm Cult led by Thallik Wormfather and the Veiled Heritance led by High Kinlady Estre. Later that year, a Tamrielic invasion force entered Coldharbour to put an end to the Planemeld, and several members of the Mages Guild ended up trapped on the Cliffs of Failure. The Soulless One entered the games to rescue them, although the Overseer gave the option to save Angof, Thallik or Estre instead. Angof promised to aid the invaders in a final assault on the Endless Stair, although it is unknown who was ultimately saved. This page was last modified on 11 May 2015, at 16:22.